Argo Navis was the ship that Jason and the Argonauts travelled on to search for exotic treasures and places. "What has this got to do with Carina? ", you may ask. Well Argo Navis was an ancient constellation but modern stellar cartographers came to the conclusion that it was too large. Therefore they spliced it into four separate constellations, which Carina is one of them. The other three are Puppis the Stern, Pyxis the Compass and Vela the Sails. In Greek mythology, Jason and the Argonauts were a band of heroes who went on a journey of adventure and encountered many obstacles, challenges and wonders. -1 in 1827, it is extremely unstable and is most likely to explode as a supernova or possibly a hypernova. It lies in a large cloud of red nebulosity and it is interesting to speculate what will happen to this cloud when it does explode. The Eta Carinae Nebula is one of the most magnificent sights in the southern skies and attracts astronomers to southern climes to witness its spectacle. Widefield views such as the one above were popular with astrophotographers imaging with the now almost obsolete medium of emulsion film before the prominence of CCD imaging in the 1990's. A film camera afforded huge expansive views of the Milky Way but the multitude of objects lacked clarity. Modern CCD detectors have the ability to reveal a wealth of detail and colour but with a greatly reduced field of view; most CCD cameras would only have a view of less than ten percent of the above image. The above image is a product of the fusion of the new and the old, the impressively wide view is due to a film camera and the detection of many star clusters and faint nebulosity is due to a highly sensitive CCD camera equipped with a H-alpha filter that captures the light of ionized hydrogen more efficiently. Mouseover each object to find out its designation. To fully appreciate the scale, the closeup to the left was taken with a CCD camera attached to a six inch telescope. The Eta Carinae Nebula is a giant amongst all the nebulae in Carina. At the heart of the nebula is a wildly unstable star called Eta Carinae. Astronomers have speculated that this violent star will explode as a cataclysmic supernova when it dies. Observations of the star have unveiled a strange pair of shells. Click the image for a closeup of the Keyhole Nebula by Johannes Schedler. Almost indistinguishable amongst the plethora of the Milky Way, this nebula is large and bright enough to be seen with the naked eye as a small dot. It is a giant in comparison to the surrounding nebulae. The angular size is so gigantic that it is several times larger than the Orion Nebula. Embedded in the centre of the nebula is the star Eta Carinae, which is as massive as 100 stars combined together. Even more amazingly the star gives out light that is equivalent to five million stars! Surrounding the star is a huge bi-lobed shell of gas that is known as the Homunculus Nebula. 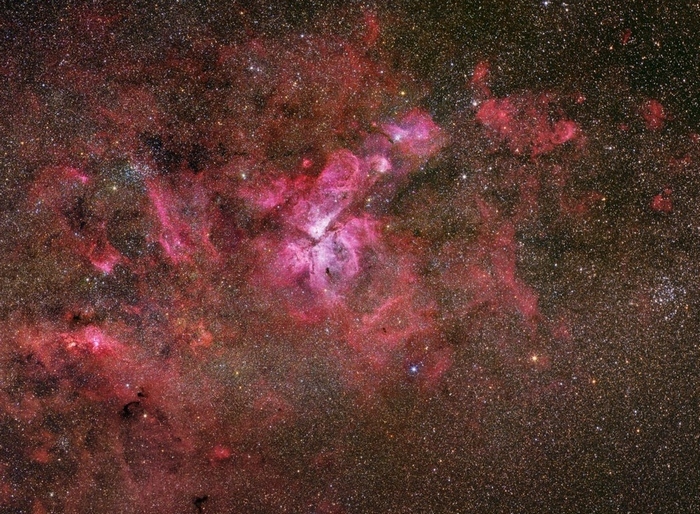 It was created when Eta Carinae had an explosive outburst in 1841. Superimposed at the south of the northern segment is the darker Keyhole Nebula, which has the uncanny shape of a keyhole. This part of the nebula has many 'elephant trunk' style rifts. Other nebulae have this feature such as IC 1396 in Cepheus and the Rosette Nebula in Monoceros. Near these structures is the white glow of the star cluster Trumpler 14. Trumpler is sometimes shortened to 'Tr'. Gabriela Mistral was a Chilean poet who had the great honour of winning a Nobel prize for her invaluable work. An even greater uncalled for honour was bestowed upon her, which was having her portrait be imprinted amongst the heavens. Her face is the outline of NGC 3324 and her face can be easily missed. It is more clearly visible in CCD camera images. The nebula is appropriately a feminine pinkish colour and the brightest part contains two stars that ionize the nebula's gas. 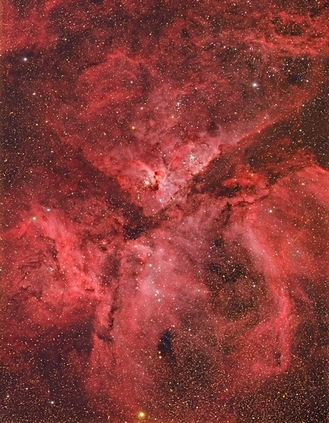 The nebula is virtually attached to the upper right portion of the Eta Carinae Nebula. This magnificent collection of 50 stars sparkles to the upper right of the Eta Carinae Nebula and is close to NGC 3324. It is also associated with a strip of nebulous gas that is part of the larger Gum 30 complex. A ruby red gem shines on the right side of the cluster and NGC 3293 could be considered as a doppelganger of the more popular Jewel Box Cluster in Crux, which is also an open cluster populated with young blue stars characterised by one lonesome red star. Red is a colour that most nebulae are because of the hydrogen within them. This pair of emission nebulae are redder than others because of a strange phenomenon with the misleading name of interstellar reddening. This process involves the absorption of blue light by dust and this means that the light emitted by an object is more red. Line of sight can generate illusions of objects being juxtaposed to each when in fact they are thousands of light years apart. That is the case with these two nebulae with NGC 3603 being twice as far as NGC 3576. The illusion is so grand that they both lie in different spiral arms of the Milky Way galaxy. NGC 3576 consists of loops of gas that curl together, not too dissimilar in appearance to solar prominences. It appears more reddened than NGC 3603 possibly because it is closer than the latter. NGC 3603 is most likely the largest emission nebula in the entire galaxy. Another aspect of this nebula that is quite large are the number of Wolf Rayet stars within the very densely packed central star cluster at the heart of the nebula. These stars were observed in detail by the Hubble Space Telescope in 1999 and were recently imaged by the HST in 2007. An enormous treasure chest of glittering diamonds, NGC 3532 has a concentration of approximately 300-500 stars with possibly a thousand members. 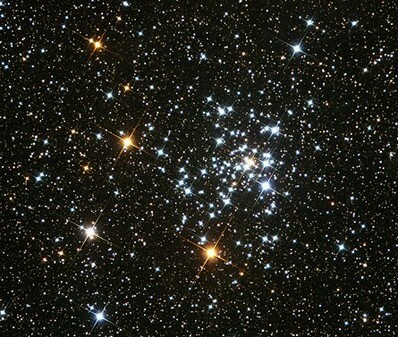 A popular name for this open cluster is the Wishing Well Cluster. The brilliance of this young cluster can easily be proved with a small telescope. If you don't have access to a telescope or southern skies, then you can glance at the picture on the left and admire its sparkly vivacious nature. 140 million years sounds like a very long time but on a galactic scale this is a very short period of time and is the age of this cluster. Altogether there are 100 stars and the brightest is a red giant that is at the centre. The open cluster NGC 2516. A diamond of stellar diamonds is what this cluster is. The stars are mainly blueish and some of them make their own patterns. It is recommended to explore this with a medium telescope with both wide and close view eyepieces for maximum enjoyment. Symmetrical is one word to describe this globular cluster, which is one of the very few in Carina since the cluster scene is dominated by the open type. It is richly populated and is a respectable alternative to the giants that are 47 Tucanae in Tucana and Omega Centauri in Centaurus. NGC 2808 is easily found snuggled between Iota and Beta Carinae. This bright magnitude 2 cluster is a southern counterpart to the Pleiades in Taurus. Like the northern Pleiades it is very close at 500 light years. Unlike the Pleiades it has about 10% of the number of stars in the Pleiades and it also doesn't have any attractive reflection nebulae around the brightest stars. NGC 3199 is an arc of pinkish red gas and could possibly be described as the southern version of Sh2-188 in Cassiopeia, although it is a Wolf Rayet bubble surrounding the star, WR18. Some amateur astronomers have given it the moniker of the Smile Nebula. Dwarfed by the enormity of the Eta Carinae Nebula, RCW 52 lies north of its more famous cousin. There are two parts to the structure of it, a bright irregular arc and more fainter nebulosity behind and to the side of the arc. Through the power of something called pareidolia (seeing things in images that aren't really there), the Batman logo might be glimpsed! Some people might also see the symbol for the Rebel Alliance from Star Wars! Alex Rodgers, Colin Campbell and John Whiteoak who under the leadership of the legendary astronomer Bart Bok, compiled a catalogue of southern nebulae while they were working at the Australian Mount Stromlo Observatory in the 1960's. Bart Bok was famous for discovering star forming globules that were dark patches in front of some emission nebulae. Nebulae with Bok globules include the Running Chicken Nebula in Centaurus and the Pacman Nebula in Cassiopeia. They are alternatively referred to as Thackeray's Globules. V341 Carinae is an irregular variable star that lies at the heart of this bipolar reflection nebula that has the extremely rare colour of sulphuric yellow. The name comes from a type of a British beer drinking instrument. Most of the gas and dust in IC 2220 has come from material shed off by the star. 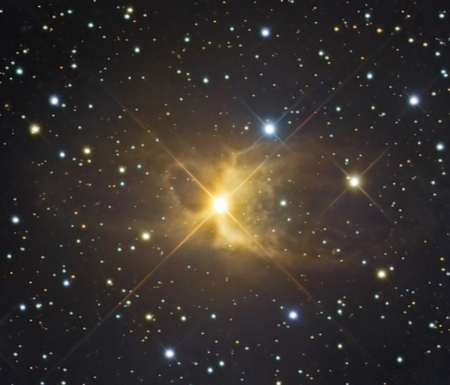 The Toby Jug Nebula has the uncommon distinction of being a yellow reflection nebula, the other notable one is the nebula that surrounds the red supergiant star Antares. It is difficult to visually see the nebula due to the penetrating glare of the central star.